Jordan has been with Little Linksters since mid-2013. He is a December 2013 Graduate of The Golf Academy of America Orlando. Jordan is originally from the small town of North Canaan CT. He has been golfing since the age of 12 and has been playing competitively since the age of 13, he was a part of his high school golf team throughout all 4 years and was a captain his senior year. 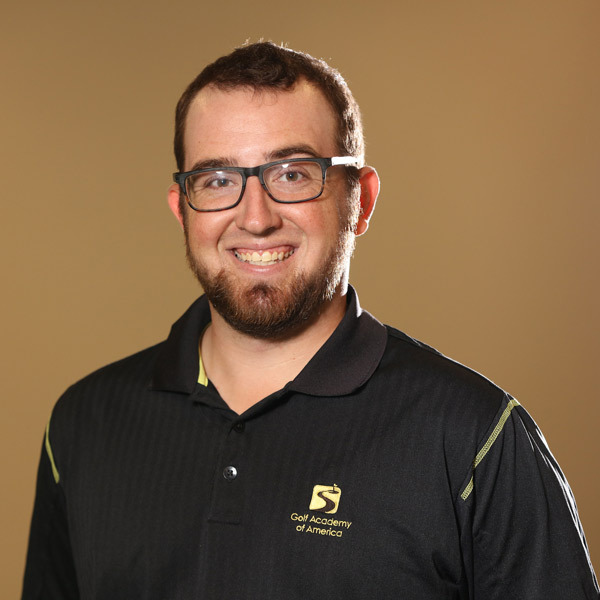 Jordan moved to Florida to pursue his passion for the game of golf and to find a job in the industry. This led him to become an instructor for Little Linksters. Jordan’s background before joining Little Linksters included working with kids as a lifeguard and teaching swim lessons. Those experiences helped him quickly become a leader within the Little Linksters organization. In June of 2015, Jordan became Little Linksters new Director of Association Programming, and specifically our original program now known as GROW. Jordan loves his role with us and could not be any more loved by his students then he is. Like all our instructors, Jordan’s philosophy of teaching golf to kids is to instill sound fundamentals and provide a fun learning environment. What a great night at Jr League Practice! Started with some putting and finished on the course! These kids really put the putting practice to work out there! An Eagle 🦅 and a Birdie! -3 for 2 holes! Coach Jordan Lashoones shared a post. Lessons started back up at CLPA After spring break and it just so happened to be this Guys Birthday! He’s been putting in a lot of work lately! Keep it up, and Happy Birthday Eric J! A sneak peak into one of my Pre-School classes this week! These kids keep me on my toes! It was a PERFECT night for some PGA Jr League Practice! Coach Jordan Lashoones is at Little Linksters Golf Academy. What a great weekend at the course! Sundays are for golf! Here’s a look into some lessons from this weekend! What a GREAT Sunday we had! Our Little Linksters GROW Program and PGA Jr League off season crews put in some hard work! Had a great lesson with this young lady, we focused on our body turn in our backswing and keeping our extension through impact! Had a great lesson with this young lady! Did a bit of putting work to get the lesson started and ended with a great session on the range! Here’s a peak at her 7 iron full swing! You’re well on your way to reaching any goals you set young lady! Coach Jordan Lashoones is at Celandine Life Prep. It was another great day for golf at Celandine Life Prep this morning! These golfers were on fire! All of my golfers at this location are making some great progress! Keep up the good work! Couldn’t have asked for a better day for our after school program at St. Luke's Lutheran School yesterday, The Florida Sunshine was out in full force and so were these little golfers! They put in some work yesterday! We even brought the “Putting Greens” to get some flat stick work in! Find more info about our after school programs at www.littlelinksters.com! It was definitely nice to see this guy back at PGA Jr League practice, cast and all! While he could only participate in the putting drills (good thing that’s his favorite part of golf!) and had to cut practice short due to Dr’s orders, he did a great job and had a great time getting back into the game with friends! Find more info and check out some other linksters at www.littlelinksters.com! Here’s a look into grace working on her tempo in her short game practice, Grace tends to move a million miles an hour in everything she does, which can make the short game tough, she did a great job yesterday slowing down and focusing on making crisp contact with her chip shots! It’s always a pleasure getting to work with this young lady! Filled in for Coach Brendon Elliott this afternoon and worked on a few different things, this video shows Brynn working on her putting stroke, she has a tendency to get a little loopy 🤪 with her back stroke so the sticks help guide her putter back and through. Keep up the great work young lady! Got some great work in with Reese this weekend, he continues to improve every week! Not quite the result he was looking for in this shot, but his fundamentals and tempo in the Backswing have made great strides! He’s added a slow backswing with a check for his club placement into his routine to slow him down and make sure he’s taking the club back on plane! Coach Jordan Lashoones updated their profile picture. Another Great Weekend of golf is in the books! Here’s a peak at some of the kids putting in work! One of my New Year Resolutions is to get out on the course more and work on my game. As a golf Instructor it can be very easy to forget to work on your own game. So far so good! Twice in one week is a great start and the week isn’t even over yet! Just from looking at this video I can still see a lot of work that needs to be done but it’s a process! Enjoy the process while working towards the results! What a Great Weekend of lessons we had! 2019 getting off to a great start! These 2 young ladies put in some great work today! After working on some putting, they did a great job working on their balance with a new balance training aid! Happy New Year Everyone! 2019 started with a few great lessons today with some amazing kids! Facebook will only allow me to post one video at a time so check out the others in the comments! Find us at www.littlelinksters.com for more info! The Girls took over the range at our Sunday Grow class this weekend! This little Lady has come such a far way in such a short amount of time! It must help having a big brother that loves to practice his game too! Golf isn’t just a game! “Best 5 minutes of my life all because of you” That little man is a golf fan for life now! Some of the kids from one of my after school classes this week were excited to take a picture with their golf friends! Love what I do! How could you not have a good day seeing faces like these! Check out this quick story about a community built golf course! I’ll definitely be adding this to the list of places I’d like to play! There wasn’t much sunshine out in the sunshine state today but these Little Linksters made the best of it! Over half the class was absent today so these boys got plenty of practice in today! Just a look into some of my latest lessons and a quick round of golf with some of the team! Our event is just around the corner but now is just as good as time as any to help! (Better to do it now before you forget 😜) Donate, become a sponsor, or sign up to participate yourself TODAY! There is no time like the present! Pass up that coffee stop for the day and help us grow the game! Coach Jordan Lashoones shared a photo. Coach Jordan Lashoones is at Wekiva Golf Club. Jaxon couldn’t wait to show all his friends at PGA Jr League the hardware he won at his event! He took 1st place in one of his recent AAU events! Keep up the Great Work Buddy! We got some full swings and on course practice with the coaches at one of our recent PGA Jr League Practices! There’s not many better places to end a day than on the course! Some shots from short game practice over the weekend! Capped off with a real tight competition! Some shots from the last few days of great golf! One of our PGA Jr League Teams had a great Match today at The Country Club of Orlando! These Kids are good! Even had an Eagle and Birdie out there today! Coach Jordan Lashoones is with Gary Attilio and 2 others. Coach Alex Hastings Golf and I Wrapped up another great PGA Jr Golf Camp! What a great bunch of golfers! The future is looking bright! Coach Jordan Lashoones shared a A miraculous birdie, a burrowing animal hole and a courageous son. Coach Jordan Lashoones shared a video. Sometimes the pros need some luck too! Love videos showing the pros interacting with the crowd, it’s hard to remember sometimes they are real people too! This guy right here practices putting more than anyone I know! He made the toughest putt on the Green at GAA, known as the “death hole 💀☠️💀” 10 times at PGA Jr League practice! Coach Jordan Lashoones shared a Phil Mickelson's Chipping 101. Listen to lefty! I think he knows a thing or 2! Coach Jordan Lashoones is at Little Linksters Golf Academy at Wekiva Golf Club. What a great day for some golf! Michael Keck Junior Golf Instructor, Alex Hastings Golf, And I had quite the group today working on some short game! (Chipping, And Pitching) These little golfers put in some good work this afternoon! A look into our PGA Jr League Practices this week! Prepping for a match tomorrow! Area of focus this week was short game! 1 vs 1 Chipping Competition and some Tic-Tac-Toe. Welcome to Sunny Florida Summers 😂. How am I supposed to Golf in this!? Happy National Women’s Golf Day! I hope everyone had a chance to enjoy a few swings today! Coach Jordan Lashoones is at Bella Collina. PGA Jr League Match 2 is in the books! What an amazing course these Golfers got to play! With another soggy day here in FL we were back at GAA for PGA Jr League, Lucky enough to be able to have access to some of the greatest equipment! Tonight we were able to work on some full swings on the V1. These kids are putting in some great work! And it’s always nice to walk outside after rain all day to and end it with a 🌈! Please Donate, Share, or reach out about any sponsorship opportunities! Our 100 Hole Fundraiser has grown every year let’s keep up the trend! Donate to myself or another participant below! PGA Jr League season is off and running with Match 1 in the books! Wish this was around when I first picked up the sticks! With the school year winding down for the summer today was our last lessons at St Lukes until next school year! As some of you may know I work for a Non profit organization Little Linksters, LLC, being a non profit we rely on donations and sponsorships, whether or not you’re located locally or somewhere across the U.S please, if you know of anyone that would like to be a sponsor please reach out to me! Here is a link to make a donation! Coach Jordan Lashoones is at Golf Academy of America- Orlando. Coach Jordan Lashoones is at Canaan Country Club. It wasn’t a long trip back home to CT but it’s always nice to hit the old stomping grounds with pops! This guy just picked up the game very recently (2 months ago) and he’s already making it look easy! We did some work using alignment sticks to help keep the putter face straight, once he was comfortable he took them away and drilled his 2nd putt! This week wrapped up our PGA Jr League Off Season session, we couldn’t have asked for better weather or a better group of golfers for this off season! These kids make growing the game easy! Coach Jordan Lashoones is feeling proud at Little Linksters Association for Junior Golf Development. The best part about being a coach is the lives that you can impact as well as those lives that can impact your own. I am lucky enough to teach a few golf lessons at CLPA (Celandine Life Prep Academy) which is a school for those with special needs. In the video below is Ryan, it took him awhile to build his swing and along the way he developed a small hesitation at the top of his swing but over the last few lessons he’s worked hard to become much more smooth and has been hitting the ball great! Our PGA Jr leaguers got some course time this week, nothing better than walking up the last hole as the sun sets! Coach Jordan Lashoones is at Little Linksters Association for Junior Golf Development. We couldn’t have had a better day for golf at our St Lukes after school class! When you can’t make it to the range, just make your own! Today our golfers worked hard on their pitching and full swing, With a focus of taking their time on each shot and at least one practice swing before every real swing. Here is our PGA Jr leaguer Lorenzo again, This last week we were able to enjoy some time out on the course for a few holes, Lorenzo has come a long way since he first started with us. The passion and drive that he has shown to improve his golf game would make any coach proud! Keep it up Lorenzo that swing is looking great! Sometimes the weather may not cooperate on days you want to hit the course (Happens a lot here in Florida), but that’s okay you can better your game in other ways! Go visit my buddy Casey Bourque at www.about-golf.org! It’s a great spot for beginner golfers of all ages, and may help you get a little more comfortable the next time you go out to the course to play or practice! Coach Jordan Lashoones updated their cover photo. We did some work on our fundamentals while doing some putting work at PGA offseason, Lorenzo has really been working hard on reading his putts and lining up his target line no matter how low he may have to go to get it done 😂🤷‍♂️. Just Like that Masters week is over 😩. Congratulations to P.Reed AKA Captain America on capturing his first Green Jacket and that always elusive 1st Major! Rickie and Jordan Spieth put on the pressure down the stretch but couldn’t quite chase him down. Couldn’t have hoped for a better Masters Sunday! Coach Jordan Lashoones shared a Gary Nicklaus Jr.'s hole-in-one. The Par 3 contest is an incredibly special part of Masters week, Family is an integral part of the par 3 competition, many of the players have family members carry their bags for the day whether that be a wife, son or daughter, or in this case a grandson. This moment right here between Mr. Nicklaus and his Grandson Gary is by far one of the most special moments a Grandfather and Grandson could ever be fortunate enough to share! As if Masters week wasn’t already the best week of the year, Tiger and Phil have to surprise everyone by teaming up on TUESDAY!? This week is going to be great! Who does everyone think will be putting on The Green Jacket this year!? Coach Jordan Lashoones is at Augusta National Golf Club. Happy Easter! I know I enjoyed a golf filled day! Hope everyone enjoyed their day as much as I did! Coach Jordan Lashoones shared a live video. Catch a sneak peak into our class from today! Long drive competition to end practice! Looks like a great day for a Hole in One at the course today 😱. The PGA Jr League Offseason Crew has been working hard lately so tonight I figured they would enjoy taking it easy with some 🍕and a 🎥. 🎥:The Greatest Game Ever Played. We decided to have Super Bowl Sunday Funday and ended up Celebrating a Birthday at our Little Linksters class today! Tune in and listen to the Little Linksters Crew! Love of the Links Radio Podcast Coming soon! Coach Jordan Lashoones is at Topgolf (Orlando).